The night we left Kota for our next (and last) adventure, we took the night train to Ambala which is north of Delhi. The train station at night was quite an experience in itself, and were it not for the fact that Sam had about five Emmanuel staff men waiting with us, I would have been terribly afraid. …Okay, I WAS afraid. There were beggars (many were small children late at night who stood there, tugging on our sleeves, looking very sad and hungry). There were buff looking groups of guys that looked more like gangs, weird men with up-close staring and personal space abnormalities…you get the picture. One man came right up to me, about two feet from my face, and just stood there, staring me down, and waiting. For what, I have no idea, but I tried to look very disinterested and invisible, to no avail. Maybe he was on drugs or hallucinating, but the men with us didn't seem alarmed. Maybe this is normal India-late-at-night-train-station behavior? We had to wait on the platform without Sam because with all the threats against him, he has to keep a low profile in public places. So he showed up when the train was coming in, just in time for us to board. The trip to Ambala was about a nine hour trip from Kota. The train experience was my first and very memorable indeed! We had a sleeper car with four bunk beds. An elderly gentleman shared our car and he snored all night! There were many sleeper cars in a row all separated by thin walls with curtains for doors. You can imagine that I didn't get much sleep that night in such a new experience. We had to hold our backpacks literally in our arms or under our feet all night to make sure they didn't get stolen. Truthfully, I carried over my feelings of insecurity and a bit of fear from the train station (even though we were perfectly safe), but it gave me a good chance to pray through the night! When we got to Ambala, Sam's driver was there to meet us with his car, along with a man who used to be a government official in the area who would be traveling with us. This was in case we ran into any trouble, the man would be able to help us out. The funny thing about Sam's driver is the fact that he has exactly one leg and one prosthetic leg—and Sam's car is a stick shift. Sam says he's been driving for him for 15 years and he likes him because he is very fast and aggressive. How I wished he had told me that at the end of the trip! I saw far too many buses coming straight at me on narrow bridges! It seems bizarre that this same driver is terrified of steep mountain roads and made Sam drive those. Even though he's not a believer, I could hear him in the back seat on some of the more dangerous stretches of road, praying out loud! 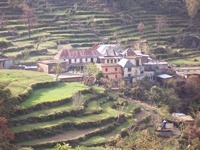 The trip from Ambala to our Himalayan destination (Himachal) was about a ten hour drive. It was the most awesome trip! We drove through hours of lush and spacious countryside, a nice break after all the cities. One state we drove through (Punjab) is the Sikh capital of either India or the world (not sure which), where many of them live. It was funny seeing whole towns in head turbans. 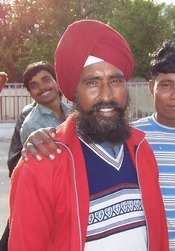 Maria and I joked that practically every Sikh man we met or saw pictures of, look like twin brothers. When we left the hot desert climate of Kota, it was in the 80s. But by morning the next day, north of Delhi, it was a cool, comfortable 70-ish. As we began our ascent of the mountains, it reminded me of pictures of Europe, because the hillsides were all terraced for farming and probably to ward off erosion from all the rain. The hillsides were sort of tropical with banana and palm trees, greening up for spring! The weather on our drive up into the mountains was very rainy and got progressively chillier. But it was spectacular! The deeper we got into the mountains, the more awesome the glacial peaks and rivers became. They were similar to our mountain peaks, but the scenery as a whole was much more contrasting and rugged. And the river we followed had the glacial silt, so it was really a beautiful green color! Toward the end of the day, we went from lush green pastures and rain, to falling snow. By the time we got to our hotel, it was an all-out blizzard. It was kind of scary on the roads because in the places where it was raining hard, mudslides were bringing huge boulders down onto the road. Many times we had to dodge these boulders in the road (some as big as 2-3 feet tall!). It was freaky after it got dark because we drove under cliff overhangs where water and mud cascaded onto our car, and we wondered when the next boulder was due to arrive! At the days end, our weather went from heavy rain to deep snow in the span of about five miles! One other thing. 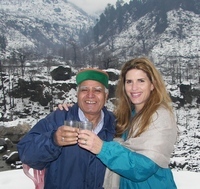 We stopped in a mountain town where they sell famous Himalayan wool shawls and clothing. Sam said these shawls go for hundreds of dollars around the world but if you get them at the store in this town, most of them are just a few dollars (some up to $50) ! We got one, of course, and they helped keep us warm in our summer attire! 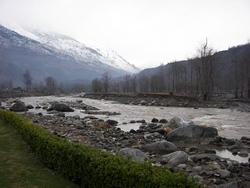 We stayed in the Kullu Valley in a town called Manali (google it for fun). The hotel was just opening from the winter season and it didn't have any heat. I guess they weren't prepared for so much snow. It was at least a foot deep by the time we got to the hotel. 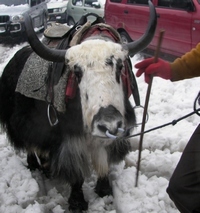 Our cabbie was not only afraid of the mountain roads, we found out he was also very afraid of snow (he'd never seen it). It took us forever to coax him out of the car. So we got checked in and shivered over dinner in the cold restaurant and then shivered into our rooms where they gave us little tiny space heaters that would have taken all night to heat the room—if they hadn't turned off the generators all night to save money! But we were smart—we got extra big fluffy blankets and kept warm! We heard that, after we left, the hotel had to shut down because of broken pipes. The hotel had a medieval flair and was really pretty. Out the windows the following morning you could see beautiful snow-covered peaks! We were going to stay two days there, but since the weather was so treacherous—we had at last two feet of snow by now—we decided we'd better leave and head back to Delhi. We were barely able to get out of the hotel parking lot because the snow was so deep. The hotel workers had shoveled all morning and still had to use five men to push us out! nd customs. Most people you meet speak at least 4-5 languages just to get by in their immediate circles! Thank goodness for good old one-language America (for the most part!). But the thing I experienced no matter where I went is the great hospitality, generosity, and heart-warming humor of the Indian people. They will drop whatever they are doing to make you feel like you are the most important person of their day. It was very convicting in my busy, selfish lifestyle where my time is my own. They give whatever they can to make you feel comfortable and welcome, and you never hear them complain or sense that you are a bother. Finally, our very last night down in Delhi we stayed at the orphanage so we could be with the kids one last time. We had so much fun. I even got up at 5:30 a.m. for their morning worship service. It is so awesome and holy to hear kids worshiping God at the tops of their lungs at this dark and early time of day. It gives me the happy chills just remembering it. We spent the next day, our last, shopping at the bargain places in Delhi. It was awesome but also very long! We went to an outdoor market place where you get dirt cheap prices on beautiful goods. I got these two hand beaded purses, with literally thousands of tiny beads covering every inch, for $7 each! It was at this place where I felt liquid dropping on my head and looked up to see a monkey in the tree overhead peeing on me! NOW I'd experienced it all. Before that, there was still something missing! Two of the orphanage staff women came along to shop for an upcoming wedding and we literally shopped till we dropped, finishing just in time to head to the orphanage, grab our stuff, and go to the airport. Our flight was scheduled to leave at 1:30 a.m. and we had to get to the airport three hours early. We appreciate all your prayers and we both feel that India has changed our lives forever! We definitely felt your prayers every step of the way and saw so many divine appointments and felt so much peace! I know for me, I could devote my life to the work of Hopegivers after all I have seen, and I hope to do just that, the Lord willing. The ministry is so big and so amazing, and I love their passion to raise up one million orphans to bring the GOOD NEWS to all people and tribes in India. To God be the glory! Great post, saved the site in hopes to read more! Good V I should definitely pronounce, impressed with your site. I had no trouble navigating through all tabs as well as related information ended up being truly easy to do to access. I recently found what I hoped for before you know it in the least. Quite unusual. Is likely to appreciate it for those who add forums or something, site theme . a tones way for your customer to communicate. Excellent task..
Once I initially commented I clicked the -Notify me when new feedback are added- checkbox and now every time a remark is added I get 4 emails with the identical comment. Is there any manner you’ll be able to remove me from that service? Thanks!